The tides have changed at Ruben Perez's revamped Seagrass. 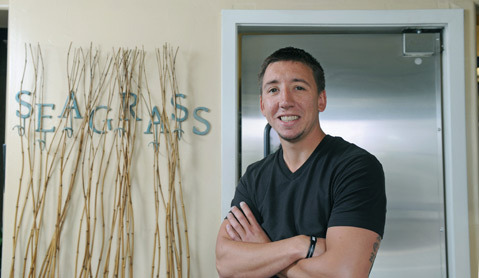 You weren’t dreaming if for a month at the beginning of the year you got the idea that Seagrass Restaurant was trying to be a mid-level, small-plates, drop-in kind of joint. There was even a legendry burger, sadly gone now, but perhaps back for another menu, for Seagrass is more than willing to keep changing. “The [January] change didn’t go with the Seagrass name and the white-linen atmosphere,” explained Ruben Perez, who holds the owner slot in his family’s business (father Robert is the chef, mom Marianna Perez is the GM, and brother Richard is running the new wine bar Taste … more on that in a bit). The latest incarnation of the menu still features some small plates — such as “black cod dressed in black,” the equally witty and tasty fish atop black vegetable “noodles,” dashi finished with squid ink, candied ginger, and watercress. Ruben Perez said, “We’re hoping to attract people who want to come in for a couple of appetizers and a glass of wine. We don’t want to be just a special-occasion restaurant, even if you will feel special when you come in here.” Perez also says the restaurant has dropped its prices so that “most entrees are $23, $24 now — there’s nothing over $30 anymore.” For instance, a hearty hoof-and-snout fest like slow-braised pork cheeks with pork belly, crispy lamb sweetbreads, roasted bone marrow, and rocket will only set you back $23. Seagrass also has kicked off Wine Cellar Dinners, letting oenophiles show up with their own stash and drink it corkage-fee-free during private events in the Roosterfish Room. “Why not enjoy your own wines at Seagrass with our flair?” Perez asks rhetorically. “I’m looking forward to those — we just want to have fun.” Three courses start at $45 per person with a $450 minimum for the room; four courses start at $55 per with a $550 minimum. See what’s new at Seagrass Restaurant and Taste Wine Bar & Retail Shop (30 E. Ortega St.,  963-1012, seagrassrestaurant.com).